Nokia is working on designing a tablet – Stephen Elop himself said so in an interview. But he wants it done right. He says that out of the many tablets on the market, only one is doing well (*cough*iPad*cough*) – and that the Nokia tablet has to be different from the rest in a uniquely Nokia way to succeed. One of the big questions yet to be answered is the software – go with Microsoft provided software or use one of their own projects? Stephen Elop gave a 20 minute interview which covered many topics – from restructuring of the company, through Nokia’s first Windows Phone 7 device and Symbian’s future, to the rivalry with Google and Nokia. 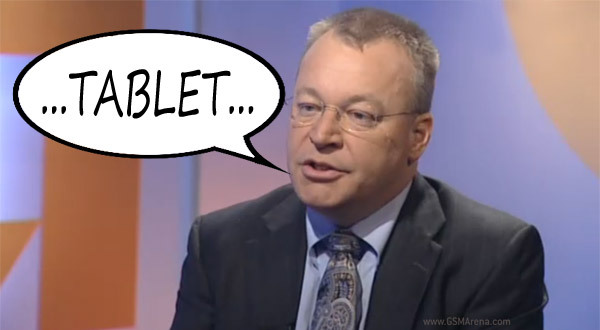 On the question of tablets, Elop says that he has challenged the design team to come up with something unique. He doesn’t believe that a tablet will have much success if it can’t stand out against the competition of hundreds of tablets, each similar to the other. The Nokia team working on the project is evaluating their options – use software from Microsoft (Windows 8 on ARM CPU maybe?) or use one of their “software assets” (MeeGo no doubt). Here’s a very interesting quote from the interview – it promises quality but we’ll have to wait for it. We’re always in a hurry to do the right things, but we’re mostly in a hurry to do the right thing. You can watch the whole interview for YLE.fi here (it’s in English, don’t worry). If you’re just interested in the tablet stuff, skip to 10:30. Or you can listen to the whole interview, it’s quite interesting. For example, Elop explains why he considers Android to be the biggest challenger and not Apple’s iOS. Android covers the price range from top to bottom, which is exactly what Nokia is trying to achieve with its products – check out the interview for more.